A product's packaging and labelling are the crucial factors when the customer sees the product alongside many alternatives and chooses it. For this reason, manufacturers attach particular importance to the high quality of the result. 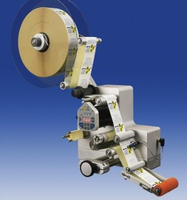 Constantly increasing throughput speeds require a higher standard of precision and reliability in order to ensure that the labels are conveyed and positioned perfectly. Electric precision drives such as the phyBASIC or ZSH series from Phytron in combination with high-quality drive electronics allow labels to be handled ultra-flexibly in continuous operation at very high speeds on glass, plastic or metal containers in a wide range of shapes. In this context, it is not only important not to damage the product, packaging or label; a steady, high-quality material flow must also be ensured in order not to ultimately endanger the planned product throughput. Phytron provides its customers in this sector with a particularly high level of reliability and a range of solutions for every application. For glued labelling or self-adhesive labels – Phytron's efficient, agile, reliable positioning drives range from the cost-effective high-performance drive, through IP-protected options, to easy-to-clean stainless steel versions with customised external contours. Effective power stages such as the ZMX+ or drivers such as the SIMATIC-compatible stepper motor modules 1-STEP-DRIVE and TM-STEP-Drive are the ideal partners here on the electronics side.